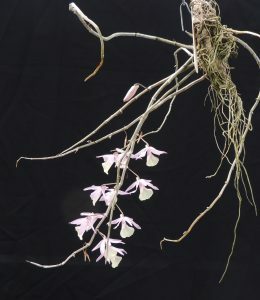 This deciduous dendrobium is an orchid we have seen regularly in our visits to Sikkim. 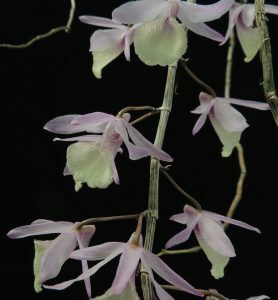 It is a warm growing species and grows on the same trees as Vanda ampulacea from 200m to about 900m altitude. It also grows as a lithophyte on large boulders and cliffs. The species is very pendulous with long thin canes that grow with lush light green leaves during the very wet summer from April to September. Plants then drop all of the leaves and remain leafless until flowering. We grow the species in Warm Asia for the summer and then move it to the roof of Cool America for the winter when we avoid spraying it with water once the leaves have been dropped. Over time the plant can form a large clump as shown by this magnificent specimen near the road to Gangtok in Sikkim. 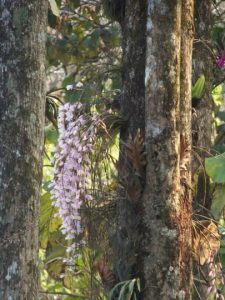 You may just be able to see the bright pink of Vanda ampulacea on the opposite side of the tree from the dendrobium.